Teach your kids they can’t time the market (and they don’t have to). Show them how buying at regular intervals over long periods means they’re bound to get lucky at least some of the time. That’s called dollar cost averaging. It’s a sure winner over the long term. More. Use sick money lingo with your teens. Parents, you’re gonna have to up your game if you want to communicate about money with your teens. Here’s your homework. More. Let Jesse inspire your kids to never whine about chores. Do your kids howl about chores? Jesse never does! Check out the secret to whine-free chores! (Yes, it’s a trick...) More. Got a STEM student? Don’t overstress or overpay on elite colleges. Yet another great thing about kids going into STEM (Science, Technology, Engineering, Math) fields: the prestige and expense of the college doesn’t matter much to future pay. So, no need to freak out about getting into that top tier school, and no need to pile on student debt seeking a pedigree. More. Inspire your kidpreneur with this teen tie triumph. Love this “Mo’s Bows” story. Started by 9 year old with 80+ year old seamstress grandma. Grown to ~$350,000 sales by age 14! More. Teach kids to manage their mobile data budget. Tired of playing mobile data overage cop with your child? Here are some suggestions for keeping the family plan under budget. More. Send the right money message at birthday party time. Are you overspending on your kids’ birthday parties? Don’t. More. Alert your kids to account activity. Show you kids how setting up card alerts can help detect fraud, catch billing mistakes, and generally lead to more mindful spending. More. 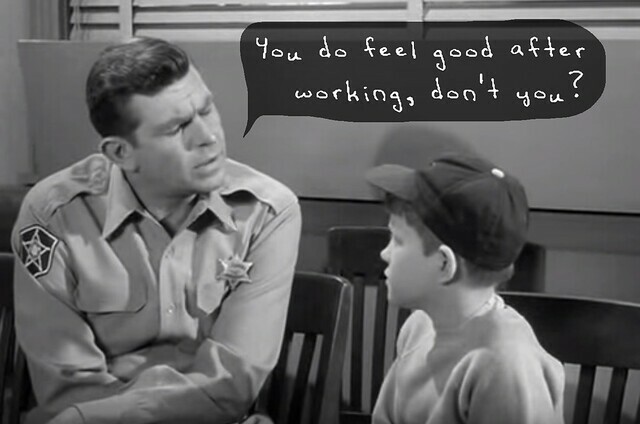 Stick to the Mayberry money rules. Is your kid negotiating with you over allowance citing what “others” get? See how Andy handles it with Opie. A classic! More. Show kids how to give passwords the finger. How to make strong passwords is a personal finance skill kids need to master. Fingerprint tech may save much of the day, but passwords will likely linger. Here’s how to create a strong one that you can remember. More. Teach your kids fuzzy fun money math. This fun “math” tip will help your family decide whether you’re spending on things you truly value. More. Know what qualifies as a legit 529 college expense. Know the rules about which institutions and expenses qualify for 529 college savings withdrawals to avoid penalties and taxes. More. Build financially capable kids. It’ easier than repairing broke adults. Frederick Douglass would have had little sympathy for your excuses for not teaching your kids good money habits. Here’s why. More. Help your kids build a sweetheart credit score. Teach your kids these 3 good habits now that lead to better credit scores and perhaps even lasting love later. Check out this new research on that second part. More. Encourage your teenpreneur without distorting reality. Take Gary Vee’s kidpreneur parenting advice: Create positive permission for your kidpreneurs to compete and regroup, but don’t hand out any 8th place trophies. More. Teach teens to favor stocks over bonds. Stocks beat bonds when it comes to your teen’s long term Roth IRA investing. Here’s why. More. Reinvest your teen’s Roth IRA dividends. By checking the boxes to reinvest dividends, your teen will get a valuable two-fer in that Roth IRA: extra compounding and dollar cost averaging. Win, win. More. Give kids a Saturday job interview instead of an allowance. Balance unpaid family responsibilities with money making opportunities using Maggie’s Saturday job interview system for kids. More. Kidnap ninja turtles for chore ransom. Mom kidnaps boys Ninja Turtles and holds them for ransom until chores are completed. Clever or criminal? More. Let your moral money compass be your kid’s guide. Help set your kid’s moral compass in the right direction when it comes to money matters. You lead the way. They’ll follow. This story is a great example. More. Draw your kids into good money habits. Draw your kids into money management discussions with a picture instead of driving them away with numbers. More. Ditch the dismissive money comments around the kids. Time to mute the dismissive money comments around the kids and turn on the open conversations. If you dismiss the little money conversations with your kids now, you’re in for some big ugly ones later. More. Let your Girl Scout sell the cookies. Back off and let your Girl Scout sell the darn cookies, so she can learn valuable business (and life) lessons. More. Rethink your reward economy. Here’s why you might want to rethink your kid’s reward chart — at least for everyday chores and behavior. More. Get the how-not-to manual on spoiling your kids for less. It just got cheaper to figure out how to raise kids who are responsible and thoughtful with money. Ron Lieber’s bestseller, The Opposite of Spoiled, just came out in paperback. More. Discuss Dee-1’s car obsession with your kids. Dawg, Dee-1 is not defined by his car. Or is he? This rapper will convince your kids that frugal cars rule. More. Teach your kids the 48-hour rule. Train your child to put some distance between the desire and the purchase. More. Give your kids some dangerous chores. Burst the bubble wrap and challenge your kids to some “dangerous” chores. Just beyond the risk lies the reward: Confidence. Resilience. Pride.. More. Teach kids profit, loss, margins, and other stuff. Your kids don’t need to grow a $25,000 business to learn about margins, profit, loss, “and all of that financial literacy stuff,” but this is still a cool story to share with them. More.